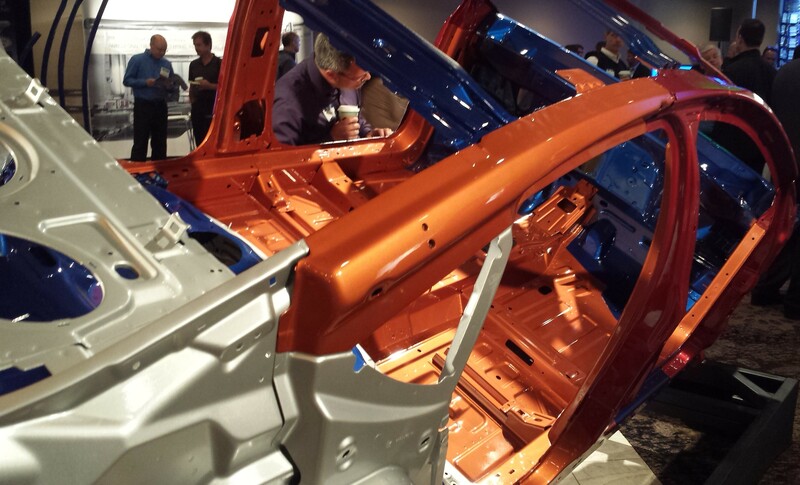 An ArcelorMittal executive proclaimed that “steel is, and always will be” the answer to vehicle design, throwing down the gauntlet to aluminum at the start of a Detroit-area automotive steel conference last week. ArcelorMittal Chief Commercial Officer Brad Davey’s speech indicated that the steel industry has a bit of a chip on its shoulder — and perhaps justifiably so, based on his argument — over the attention given to its rivals’ contributions to lightweighting and the environment. It also indicates that repairers should make sure to stay current on what you can and can’t do with higher and higher strength steels, which likely will be more common and behave differently than their lower-strength precursor. Rather than relying on “more expensive alternate materials,” fuel economy targets can be met by using steel in automotive fleets, Davey said at the Great Designs in Steel conference in Livonia, Mich. The federal government’s fleetwide 54.5 mpg 2025 target is looming, and OEMs are scrambling to figure out how to shave off enough weight to get them at least part of the way there. To this end, Davey gave a nod to the vehicles whose bodies-in-white were on display at the event, such as the 2015 Chrysler 200, which is 60 percent high-strength steel. Steel produced one-fifth to a twentieth of the competitors’ emissions, and it could be extensively recycled. “Steel is the greenest material,” Davey said. In the future, ArcelorMittal plans a “steady stream” of automotive innovations to “leapfrog” its existing ones, he said. He pointed out that in 1990, ArcelorMittal was the first steelmaker to “embed” an engineer with an OEM to explain how steel could or could be used in new automotive designs. Recently, that was done with the 2014 Acura MDX, which cut 275 pounds with high-strength steel, aluminum and magnesium making up 64 percent of its body. In that vein, the company’s “S-in-motion” assistance could cut 384 pounds off a truck from their 2014 model years, he said. Plus, an OEM wouldn’t need to spend excessive amounts on infrastructure, he said. In the last 20 years, steel has raised its game to six times the strength — and nothing else could say that. Of course, one could argue that the other materials were a lot stronger initially, but steel has really made impressive leaps; Nissan, for example, was honored at the event for its 1.2-gigapascal steel — a fancy way of referring to the 1,180-megapascal level; traditional “mild steel” maxes out roughly at 250 megapascals. 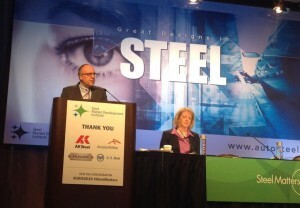 “The steel industry is constantly in a state of technological revolution that it doesn’t get credit for,” Davey said.